This moist chocolate cupcake is so delicious, macro-friendly, and ready to be topped with your favorite frosting! 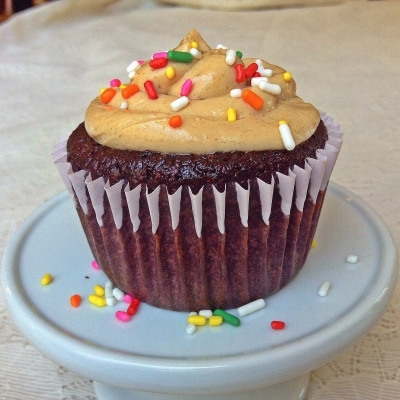 It is pictured with a low cal peanut butter cream cheese frosting (peanut butter mixed with fat free cream cheese and stevia to taste), but would be great topped with anything! Mix all dry ingredients and all wet ingredients separately. Make sure your wet ingredients are room temperature. With a hand mixer, mix your wet ingredients in with the dry ingredients. Line a muffin tray with 9 paper liners. Fill liners with batter and bake at 350F for 20-22 minutes. Remove cupcakes from oven and let cool in the tray. Store in an airtight container. Top with any frosting you'd like!